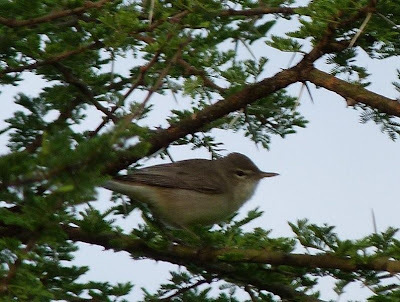 March is the month when northward migration of songbirds gets underway in East Africa, so this weekend I was excited to be out west of Arusha with friends and to find stacks of migrants already on the move. 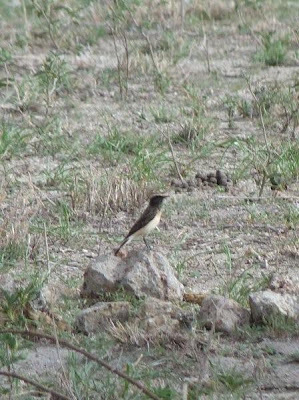 Driving in I noticed some really smart looking wheatears (both pied, and the very impressive northern wheatear, though many of them have already set off on their mammoth treck - perhaps as far as Alaska). 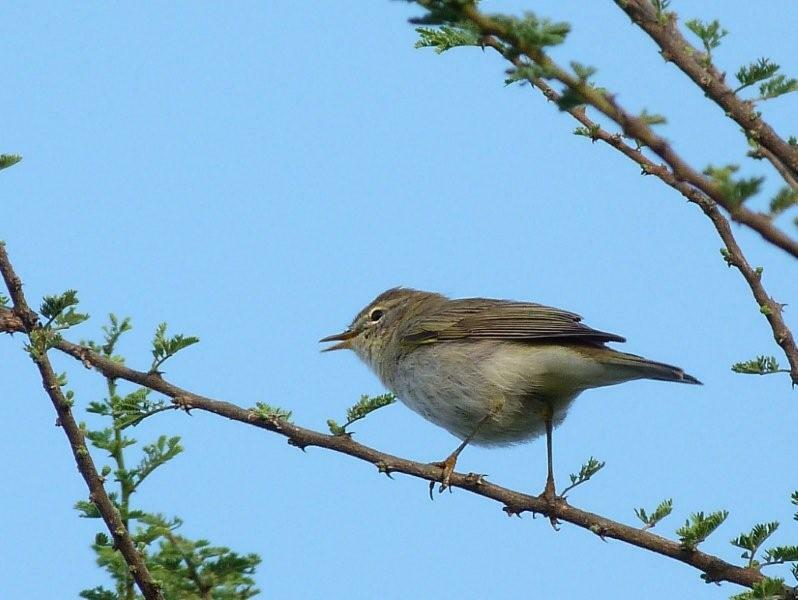 But the highlight for me was the bushes alive with warblers on Saturday morning. I saw flocks of Willow Warblers, Olivaceous Warblers, Common Whitethroats and even little groups of Barred Warblers, usually a very scarce migrant around here. Some of them were even singing, in anticipation of starting breeding in a few more weeks when they get back to Europe! Having a managed a few photos I thought it the ideal opportunity to talk about bird migration. Barred warblers are always a treat to see: headed to eastern Europe. 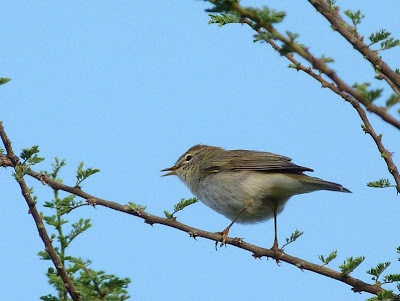 All these birds have been rather scarce until now, this season, and many of us have been wondering where they've got to - usually Willow Warblers and Olivaceous Warblers are one of the commonest birds in the bush from November to March, this year there have hardly been any. It's a question that will be familiar to many readers from Europe - where have the migrant birds gone? Research has suggested over the last few years that in Europe at least, migrant birds are declining faster than resident species, a change that has been attributed mainly to climate change. A number of theories have been put forward to explain why migrant birds may fare worse than resident species from the impacts of climate change - from them simply missing the peak spring food availability by arriving to late in Europe as springs get warmer (and therefore earlier), to direct effects of drought or land-use change in Africa. A recent paper (sorry, not free) has attempted to look into some of these likely causes using data on breeding population changes in the UK, and it serves as a nice bit of background to some of the remarkable things that birds do when they set off on their amazing migrations. Obviously any study seeking to understand population changes in migrant birds from a purely European basis (let alone a purely UK perspective!) is going to have some limitations - this study is no exception. Essentially, the study is a series of correlation analysis trying to match population trends with some of the things known about the ecology of the species and look for common patterns. If they find common patterns there's no guarantee that the patterns are really causal (IE we can't say for certain that populations are declining because of factor X), but it can give us some good pointers for further and more detailed research. That's especially true of this analysis, because data on many of the direct factors people are interested in simply aren't available: instead of having detailed information on how the climate has changed in each species African distribution, they have to use large-scale region the occupy (such as the arid Sahel, the moister Forest/Savannah mosaics, etc.) as a 'proxy'. But that same large-scale region, is also going to enjoy similar variation in any number of other factors, not least land-use pressures, so just because consistent patterns might be found between the regions each bird species spends the winter in, doesn't mean we can say hat's a consequence of climate change, or land-use change. Other factors they used in the study include the habitat used during the time in Africa - forest, wetland, open or generalist, and a variety of factors detailing arrival times in Europe in the Spring and the changes in these arrival times (this is potentially interesting because, say, birds that always arrive late in the spring might be more, or less, affected by changes to early spring temperatures than those that normally arrive early. Similarly, those that have changes their arrival times fast, might be less impacted by further climate change than those that have, so far, not changed at all). 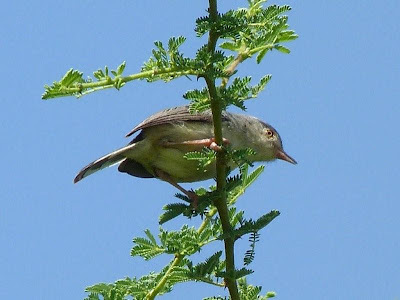 Eastern Olivaceous Warbler - headed to central Asia or south-eastern Europe. To cut a long story short Okenden and colleagues conclude that the most important factor, by a long way, in determining rate of decline is the large region within which each species winters: if a species winters in the arid Sahel, it's probably not declined, but if it prefers the more humid regions then the chances are high that a decline has occurred. Next most important was the habitat occupied during the winter: those generalist species showing few declines compared to those specialists of open or woodland habitats. They also find some evidence that the mean data of arrival in the UK is important - species arriving later having steeper population declines whereas those birds that are able to change their arrival data rapidly have slower declines (or even increases). Now, it's pretty hard to interpret the main effects of region too much - it's quite possible that regional land use pressures are a factor (which is supported to a degree by the additional importance of habitat), but equally regional patterns in climate change also tend to vary together. So let's not worry so much about that for now (though it is far and away the biggest factor correlating with the declines - my guess from knowing the situation on the ground is that to date land degredation is far and away the biggest cause down here, not climate change yet), and focus on those factors to do with timing, because it's here that things get interesting in our part of the world- by watching when our birds leave here, we can help untangle some of the questions around departure / arrival dates. It has been suggested, for example, that it might just be that the birds don't know when to leave here: in most of the world we know that birds can monitor precisely changes in daylength to determine dates (17mins difference 'summer' to 'winter' is the shortest known detected difference by a bird). If the date of migration is 'hard-wired' into the bird (ie if it hatches with a programmed departure date), it takes evolution to vary that feature. That's probably even harder here on the equator, where there is essentially no meaningful day length variation. Here, we believe the only way birds can leave the area at the right time is by, somehow, maintaining a 'clock' throughout the year that counts the days and tells them when to leave (experiments keeping birds in constant environmental conditions demonstrate that this really does happen). What the mechanism of this clock might be, however, we have very little idea, but to maintain such a clock and then change the settings for a different departure date could be rather complicated, meaning these migrants are simply unable to change fast. 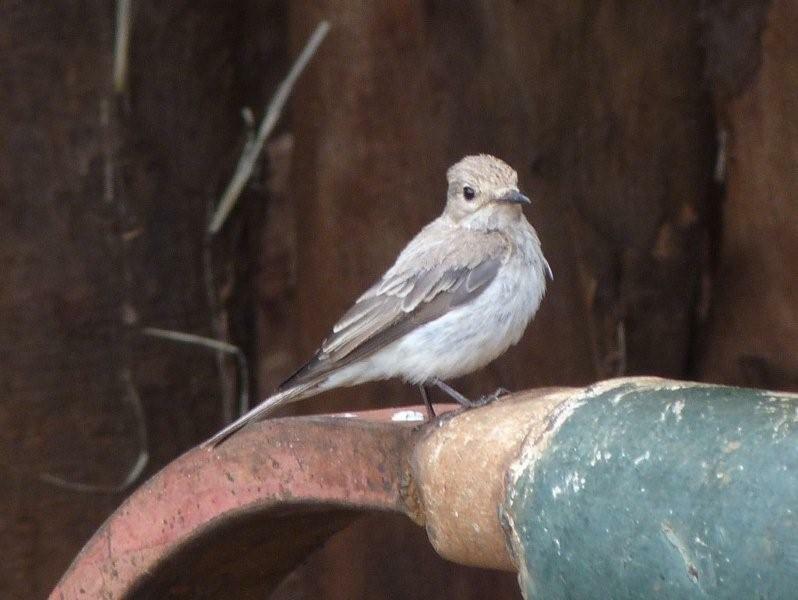 Alternatively, there's a theory that suggests many long-distance migrants might be constrained in their departure date by having to wait for the start of the rains to encourage lots of insects out, so the birds can feed fast enough to fuel for their migration journey. [If that's the case, our early rains this year should be keeping everything very happy and maybe we'll see early arrivals in Europe this year too!] In other words, perhaps birds can happily survive here through the dry season, but they can't get the extra food they need to power a migration until the rains arrive and their departure is limited by when that happens - which doesn't vary as much, or in the same direction as changes have occurred to spring temperatures in Europe. Migration takes a huge amount of effort and energy (we covered some of it in the Wheatear Migration story) and the adaptations that some birds have evolved to undertake these journeys are extraordinary. Not only can they double their body mass with stored fat with no apparent heart-attack risk, but the physiological changes involved in migration are just extraordinary: birds feed like crazy to accumulate fat, but so costly is having excess weight, and so large the costs of migration that as they set off they metabolise some of their digestive system itself, an extraordinary adaptation that means on arrival or during stopover before they can feed effectively they must first rebuild their digestive system. It's not hard to believe, therefore, that they might ave to wait until feeding conditions are optimal before being able to start a migration. If, like me, you find these adaptations extraordinary, even before you look at how the birds use magnetism, stars, sun and even sound cues to navigate, it's easy to forget how recent all of this has evolved. Although there might well be challenges involved in evolving different migration route or different migration times, evolution is an immensely powerful process. The whole of the current European/African migration system is, for example, a very recent affair: only 12,000 years ago most of northern and central Europe was covered in ice. So the current migrations have all evolved since then, whilst the average evolutionary age of birds involved in migrations (IE, when they last shared a common ancestor) is around a million years. Indeed, one of the most remarkable ideas coming from recent theory about bird migrations is that, once the basic ability to do partial migrations had evolved in birds (probably very soon after birds themselves appeared), it only takes around 25 generations (40 years) for a species to evolve complete migratory behaviour, or complete sedentary behaviour. So migration is actually a highly dynamic capacity of birds, and certainly far from fixed. Indeed, we're already seeing some interesting changes in migratory behaviour in Europe, the best example being Blackcaps which used to spend the winter around southern Europe or into north Africa (some make here here to Tanzania, usually in the forests), but a population has now evolved a completely different strategy involving heading north west from Germany to UK, where winters are getting warmer and there are lots of people who feed the birds. So effective has this migration been, that the population making this movement is rapidly increasing. So it's easy to look at current population declines of migrant birds and despair: the road seems set to zero. But a historical perspective suggests that birds still have one or two tricks up their wings. 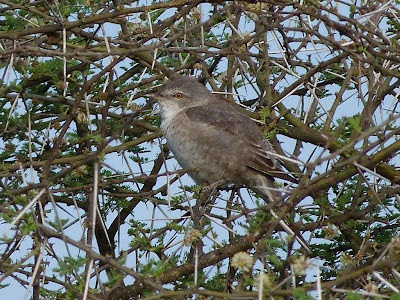 For sure we need to do what we can to help migrant birds, and if we continue to lose or degrade habitat across Africa it's bad news not only for these migrant species. But evolution is on our side, so let's hope what between us we can do something to keep this amazing migratory phenomenon going for future generations to enjoy! And in the mean time, if you're in the bush in the next few weeks, do keep your eyes open and enjoy all the migrants! Not very scientific I know. However, now I understand that the earlier they leave the better they'll be able to cash in on Europe's early spring, it's a lot less traumatic. Lewa Downs wildlife corridor really works! Nairobi bugs: WMD or Cancer cure? !